I have always felt kind of sorry for the oysters. Silly little shellfish, so foolishly trusting. 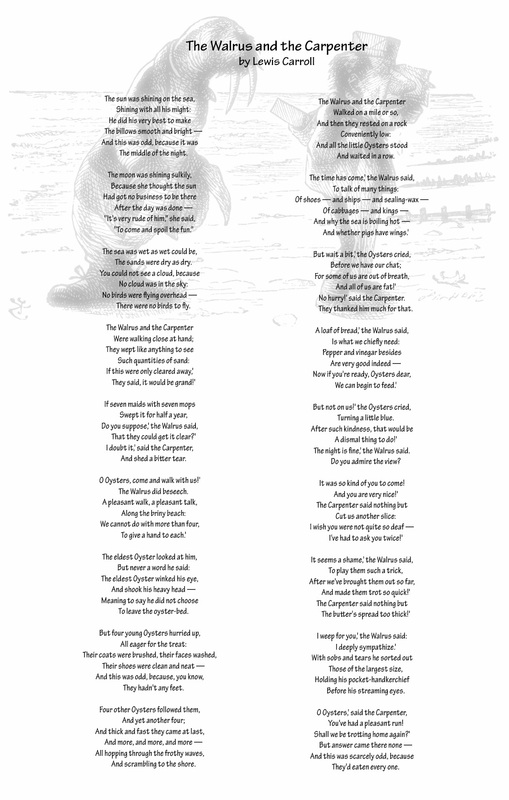 “The Walrus and the Carpenter” is a narrative poem by Lewis Carroll. It appears in Through the Looking-Glass, (1871). The poem is recited in chapter 4, by Tweedledum and Tweedledee, to Alice. But they taste so good. Raw on the half-shell, breaded and deep fried, or topped with various herbs, bread crumbs and a butter sauce and baked in their shells to be Oysters Rockefeller. You see? That’s JUST how the walrus and the carpenter felt. Those poor oysters didn’t stand a chance. And, of course, they didn’t have any feet. I love oysters too – especially the ones in Grand Central’s Oyster Bar. But I remember being so-oooo upset as a child that they could be so easily duped, and the carpenter feigning sorrow behind his handkerchief. What a cad. Poor, silly oysters. It wasn’t their fault they were both gullible and yummy. No, but I was so sorry that they were so gullible. I used to be deeply worried by the Tenniel illustration of said event. Amazing what sticks.